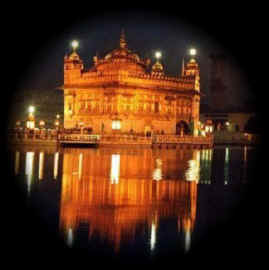 November 15, 2005, is the birth-anninversary of Guru Nanak, the Founder of Sikhism. This brief write up is to introduce Guru Nanak, a great spiritual teacher and his message. Guru Nanak Founder of Sikhism-Guru Nanak (1469-1539), the founder of Sikhism, was born in Punjab, an area located in Northern India and Pakistan. After a revelatory experience at the age of 37, Guru Nanak traveled extensively to spread his word. Guru Nanak’s message was simple. It was: “There is one God and one human race.” He was a poet, a mystic, a philosopher, and a singer. His philosophy centered on belief in one God for all of creation, a God that is formless, omnipresent, compassionate, and attainable through prayer, humility, service, meditation, and virtuous living. He denounced ritualism, discrimination against women and against those of lower socioeconomic status. This philosophy became the foundation of Sikhism which is now the fifth largest religion in the world. Guru is a reverential term for the supreme teacher in the Sikh tradition. Nanak’s followers became known as Sikhs. Sikh means seeker or truth or disciple. Guru Nanak’s Teachings-The three basic tenets of Guru Nanak’s teachings are (1) Naam Japo – Constant meditation on God’s name, (2) Kirat Karo – Earning livelihood through honest means, and (3) Wand Chakko- Sharing one’s earnings out of love and compassion for others. Guru Nanak taught that human life is an opportunity for spiritual union with the Supreme Being and that this stage of enlightenment can be achieved by God’s Grace. Any person of whatever intellectual or economic level may become enlightened through a life of single-minded devotion to God. As all creation has the same origin and end, humans must live in harmony with God’s creation by conducting themselves through life with love, forgiveness, compassion, simplicity, and justice. Equality-Guru Nanak preached total equality for all people of whatever race or gender. He denounced the idea that spirituality was only for those of the male gender. He perceived that there could be no enduring democratic culture unless it was grounded in unreserved recognition of the full equality of woman with man. Guru Nanak instituted three practices to promote equality and alleviate suffering. Sangat was an invitation to people of all backgrounds to meditate and pray together. Irrespective of their social background, caste, race or religion, people were asked to sit and eat together to create a sense of equality, called Pangat. He also started a tradition of free distribution of food to rich and poor alike, termed Langar. These customs instituted by Guru Nanak continue to be observed by Sikh communities throughout the world. He preached that one of the requisites for the betterment of individuals was Sadh-Sangat (keeping the company of spiritually-oriented persons), and righteous conduct towards one’s neighbors. Religion of the household- Guru Nanak’s religion is for the householder. He was a teacher of the positive approach and his teachings are a call to life. He did not accept the idea of retreating from family and relatives in search of God. He strongly disapproved of a life of withdrawal and encouraged full participation in family, workday life and responsibility in society as the framework within which to seek God. According to him salvation is not incompatible with joy—laughing, eating, playing, and dressing well. Service- There can be no understating the importance of love and service in Guru Nanak’s teachings. According to his doctrine, the Beloved is within all people and therefore, serving people is serving God. He encouraged his followers to live normal, compassionate lives in tandem with the larger society. seva (service to the wider community) and volunteerism, not just within the Sikh community but throughout the community of man, is a key goal set for all Sikhs. Respect for all faiths- Guru Nanak was opposed to any exclusive claim on spiritual truth. This indicates a pluralistic acceptance of the legitimacy of all faiths, and therefore, an acceptance of all groups and individuals. He did not attempt to convert the followers of other faiths, but rather urged them to rediscover the internal significance of their own beliefs and rituals, not forsaking their chosen paths. He collected the hymns of spiritual men of other faiths, some of whom were shunned by society because of their caste and social status, and included them in the Scriptures for his own followers. This collection later formed the Sikh scriptures. Interfaith dialogue and cooperation have been a part of Sikhism since Guru Nanak’s time. Guru Nanak’s groundbreaking example of interfaith acceptance 500 years ago is even more resoundingly pertinent in a world fragmented by religious strife. He showed that respect, and not just tolerance, for those of other faiths is the cornerstone of a democratic society. Overview-Guru Nanak’s teachings are simple and straightforward. His sole mission was the spiritual revival of mankind in the modern world. Equality, liberty, social justice, love and compassion for all, as well as community service are the cornerstones of his message. Guru Nanak’s status is that of a universal leader whose teachings offer the entire human race the serenity that gives spiritual strength to face the sufferings of this world by accepting them with calmness, love, and devotion, and by working to alleviate them. Those who know one God and shun duality are merged in God. Acts of kindness, virtue, and inner enthusiasm in serving others results in the mind’s immersion in God. Spiritual wisdom comes from inner searching. It is diminished by arguments and competition. When you taste the ultimate nectar of God (love and God’s presence in your heart), all vice and negativity crumble to dust. True education makes one a benevolent and compassionate person. When I become Yours, O Lord, the whole world I see as mine. When ego departs, You manifest and I see everything connected in You. Happiness and sadness are outer garments of each person’s life. These spiritual sayings are from the Sikh Scriptures – the Guru Granth Sahib. During their own lifetimes, Guru Nanak and his successors compiled their sacred poetic devotional compositions as part of the Sikh scripture.